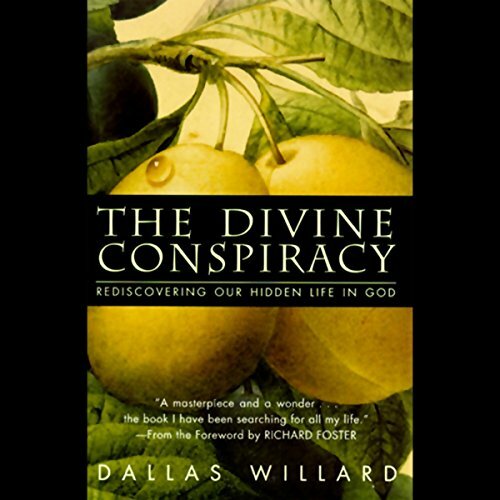 In The Divine Conspiracy, Dallas Willard gracefully weaves biblical teaching, popular culture, science, scholarship, and spiritual practice into a tour de force that shows the necessity of profound change in how we view our lives and faith. Absolutely incredible book. Caused me to obtain the print copies of all 3 in this series (1. 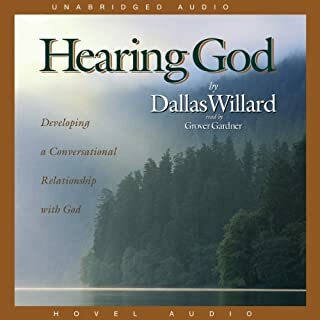 Hearing God, 2. The Spirit of the Disciplines, 3. The Divine Conspiracy) so that I could study them more closely, as well as MP3 copies of the other two. All are good; this is the best. He has since written others, BTW, which I've also obtained. Willard is a philosophy professor, very intelligent, and a very clear writer. Unlike other Christian philosphers I've read, though, he does not soft-peddle Christianity or Christ. He actually shows how the Church in general has softened much New Testament truth. He is teaching nothing new here ("new", with regard to Christianty, is generally synonymous with "distorted"); he goes back to the Word itself, attempting to look at it with no bias, no preconceived notions except that it is true. In my group of favorite authors, he has joined A.W.Tozer and C.S.Lewis; that is heady company indeed. I cannot recommend his (or their) works highly enough. If you are a Richard Foster fan ("Celebration of Discipline"), you should understand that Foster considers Willard his mentor. Foster's first pastorate was at a small church that Willard attended; Willard's influence was very strong. I have read and now listened to this book probably a dozen times total, with plans for more... And I read or listen to good authorship/critique all the time. It is not uncommon for me to look at the vast amount of things on my iPod, from Public Radio to Comedy to LOST episodes, and just be like, ehhh... 'Why not plug into the mother of all ideas...' that Christ is reigning right now and that might I connect into it and benefit (a la "The Divine Conspiracy"). 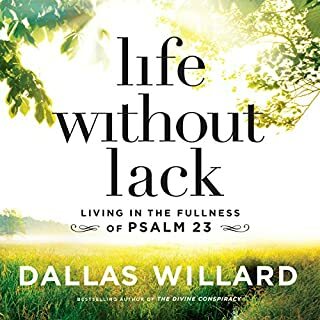 This to say, what Dallas achieves in this book is extraordinary -- I say this having been a lifetime Christian, but not until this book having the right framework for actually following Jesus in all of his brilliance, care, and ability. If you know about Dallas Willard, you know that he has been Professor at a top mainstream university (Univ. So. California) for 30+ years. He's no cultural Christian. He has applied immense thought, careful debate, and great humility when it comes to considering Jesus Christ and what it means to follow him. This book is an outflow of this. I know of no other living author like Dallas. Why not sit with this book and let your universe be opened a little wider? You won't be disappointed. NOTE: The book may seem a bit oblique until the 3rd or 4th Chapter. But trust me, worth every sentence and it comes together more than handsomely by later chapters. Again, I listen to this audiobook over and over. Why am I typing this? I should be listening to it right now and trust me talking about it like this is causing a deep Pavlovian response. See, the ideas are big enough where you actually hear them in greater clarity the more you repeat them. Excited? You should be. Good has entered the world with vision, intention, and means to overcome *all* evil. And you are a key part. Do the deed. Get it here or somehow, even if from the library. Blessings. This book is, hands down, the best book I have ever purchased from Audible. It is deep and scholarly and yet very accessible. I have both the audio version and a hard-cover version. Reading the hard-cover version takes effort, but the narrator (Thomas Penny) does an absolute masterful job of helping the reader fully grasp what the author intended to convey. 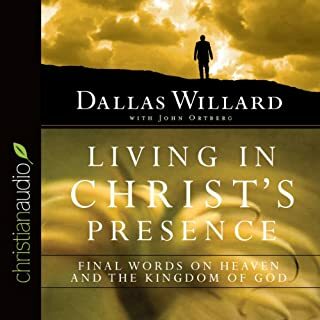 I have another Dallas Willard book that is narrated by Willard himself. For my money Penny is well worth, well, every penny. He really brings this remarkable book to life. It is not an understatement for me to say that this is a book I have been searching for much of my life. It answers many of the deep, nagging questions that have painfully vexed me for some time. I am now learning to sit at the feet of Jesus and learn from my Master. The Holy Spirit has used this book in an amazing way. I am deeply grateful. Blessed are those who hunger for righteousness for they will be filled. I have been walking with the Lord, with greater and lesser degrees of success for three decades. 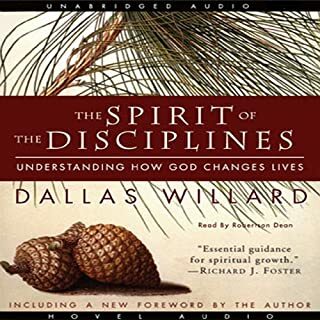 I’m also a pastor with the same great and lesser degree of “success.” Dallas Willard has watered my soul more than any single Christian writer, apologist, theologian or founding father of the faith. Drink deeply. 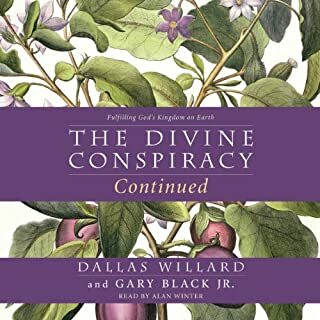 A long time favorite work of Dallas Willard, I decided to listen to the Divine Conspiracy this time around. It did not disappoint! The narrator dictated the text just as I imagined Willard might have done when writing it. 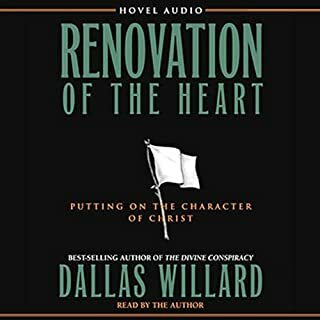 As far as the content, what could I say to capture the brilliance of Dallas Willard as he navigates the sermon on the mount, the prophecies of Isaiah, and the philosophers both modern and ancient, as he makes the case that the Kingdom of God is a not only an idea of some futuristic destination, but a way of life available to us now. In enacting the Kingdom way in our lives now, we discover the treasure of the flourishing life. A must read (listen) for everyone desiring to follow Jesus! tough listening at times due to the deep insight but well worth it. great insight into the invisible world around us. The content is very good. I am buying the book. Recommend to any Christian and regardless of how long they've been following Jesus. Right book at the right time! I can say that this book was so powerful and so timely for me. I tried reading it about 7 years ago and I wasn't in the right place personally; however, now was the right time and this was the right book. Jesus Christ is the center of this book and the following of Christ and truly being His disciples is the thrust. I think the writing is accessible enough for most people. When I was listening I was able to engage the material even as Willard is a Philosophy professor and writer. I am still meditating and unpacking the impact of this book on my life and the rest of my life. I am talking to and following Jesus in much bigger ways. I am also trying to teach others to go and do likewise. I'm probably going to have to listen to this again and take notes... This is packed with wisdom and offers a considered and well thought out reason for practiced Christianity that touches the soul. This is an excellent book for Spiritual Formation and will cause it's readers a great deal of introspection, reflection, reality checking and communion with God in confession and repentance. It give a clarion call to being true discipleship which is itself true Christianity. I love the way Dallas Willard uses no nonsense langue to get his points across calling us the apprentices of Jesus. There were points when reading this when I just had to stop and pray. The thrust of the book, that we live in a Trinitarian, supernatural universe and that truth of reality is far greater than the presuppositions of naturalism and materialism holding that God is real and the spiritual and physical world are just as real as each other is a much needed message today. A worthy... difficult in places, but worthwhile read... the kind of book that I'm sure to read again. overall quite good. loses puff towards the end. I am not sure I agree with a fair bit of what he has to say. Some good substance but some I think he is off track on. Specifically I think he is incorrect as to his interpretation of the Beatitudes.